Rabbi Mendel Danow spent his first day in Florida preparing to help others as Hurricane Michael approached. While tens of thousands of people were busying themselves with storm preparations or heading out of town to escape Hurricane Michael—which made landfall as a devastating Category 4 storm with sustained winds topping 150 mph, and was called the “worst-case scenario” for the Panhandle by the National Weather Service—Rabbi Mendel and Nechama Danow were just moving into their new home in Pensacola, Fla., where they will serve as Chabad-Lubavitch emissaries. Despite the fact that neither has ever experienced a hurricane before—she is from Israel and he grew up in Sweden—the Danows are ready to help where they can. The Danows have had some preparing to do for themselves as well. The couple spent their first day in Florida trying to secure much-needed supplies, including gas for their rental car, a case of water, flashlights and batteries. As the storm grew in strength far to the east, sparing Pensacola much of the weather, the Danows opened their three-bedroom home to Rabbi Yeshayahu and Rochel Tenenboim, co-directors of Chabad of the Emerald Coast, and their family who had to evacuate their own home in Destin and another community member from Destin who needed a place to go, despite the fact that their kitchen hadn’t even been set up yet. “We thought we’d come to town and have a few weeks to settle down, but Hashem made our plans different, so we had to start working right away,” said Nechama Danow. “Our furniture is not here, we don’t have anything in our house, and our kitchen wasn’t even kosher until two hours ago. “But this is the whole reason we came—to be here not just in the easy times, but to be here when we are needed and to give help to others,” she added. In her first day in her new home, Nechama Danow and a volunteer prepared meals for students who would be taking shelter with them during the hurricane. In Tallahassee, which is under an “extreme wind warning,” from the NWS, Rabbi Schneur Zalman and Chana Oirechman, co-directors of Chabad Lubavitch of the Panhandle, were riding out the storm at their Chabad House, along with their children. 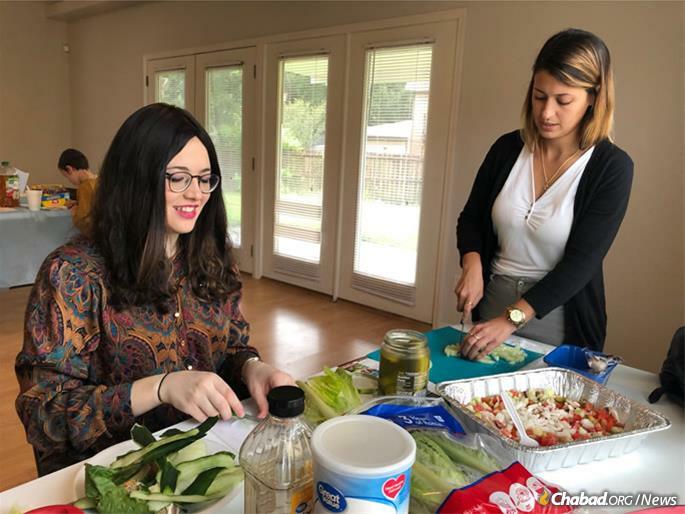 They also opened their Chabad House to those students from nearby Florida State University who have remained in Tallahassee and don’t want to be alone. By early Wednesday afternoon, the power was out in the area, trees and debris were being blown all around with the main strength of the storm still to come. that by us Jews helping a non Jew, a Goy, we show how we truly are a unique nation.